Please, is it asking too much to repair your ball marks! The photo above shows a green shredded not by golf balls but rather by huge hail stones that fell near Wichita, Kansas on September 15, 2010. The largest stone measured had a circumference of 15.7 inches (39.9 cm), weighed 1.1 pounds (0.5 kg) and had a diameter of 7.75 inches (19.7 cm), which is a new state record for Kansas. On the afternoon of the fifteenth, thunderstorms developed in Reno County, Kansas just before 4:00 p.m. (local time). Hot air at the surface and very high dewpoints led to explosive thunderstorm development. Several supercell thunderstorm formed, producing six confirmed tornadoes, extensive straight line wind damage and a phenomenal hail storm. 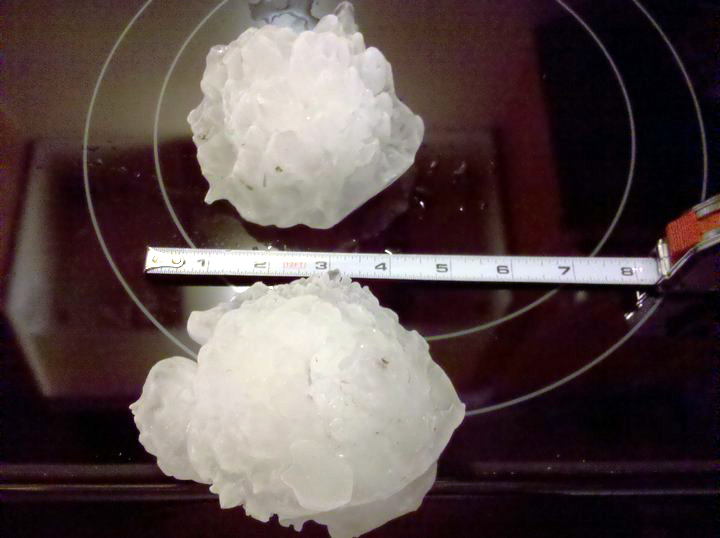 In some jurisdictions, the hail stones were bigger than golf balls; they were baseball to softball sized. In order for hail to form, strong updrafts are needed. Otherwise, the ice pellets that form quickly fall and melt before reaching the surface. For the biggest stones, powerful air currents keep the hail aloft. The stones are coated with a layer of water which freezes each time they're shot upward. They'll drop toward the surface when the updraft subsides. However, if the stones encounter another stronger updraft, they'll acquire another coating of ice. This cycle can be repeated several times and in fact must be repeated mutilple times for the really big, damaging hail stones to develop. Note, when playing a round of golf, you should never look up when someone yells "fore!" This also applies if you notice an anvil cloud not too far in the distance and hear a sudden "whooshing" sound. The hail stones that pummeled this green fell to the ground at over 120 mph (44.7 m/s).